From Nagasaki, we took a train north to Karatsu. Karatsu is a seaside town with a long history of producing beautiful earthenware pottery. This is because many potters can form dishes from clay, but the knowledge of how to successfully glaze and fire clay is paramount to this art form. A Kiln is the heart and soul of this craft. Today there are many kilns in active use around Karatsu, as well as ruins of old kilns scattered throughout Saga Prefecture. Many of the kilns are ‘Climbing Kilns,’ or kilns that you can walk into. Karatsu earthenware is made from a local clay that is high in iron, and is often left undecorated, or simply decorated with an iron-based underglaze. The unadorned ceramic is very granulated, earthy, and simple, and it gives a very pleasing, organic natural tone to everyday pieces. They make tea cups, rice bowls, vases, sake bottles and cups, plates, matcha bowls and dishes, all with this earthy granulated clay finish, which is very different from the elegant, smooth and shiny finish of porcelain. I love the Karatsu wabi shabi pottery, and in general, I love non-symmetrical and a bit uneven pottery, where you can still see the fingerprints of the potter on the clay. Karatsu earthenware pottery techniques have been practiced here since the late 16th century, after the technique was brought over from Korea. The Karatsu Castle towers above the town, and its stone walls create a promenade along the sea. In the distance you can see small fishing islands rising from the sea. We stayed in a beautiful guesthouse in Karatsu. Ryokan Yoyokaku offered us a spacious room overlooking their manicured gardens. It is a perfect example of the genius of Japanese architectural design, incorporating nature into interior design, that I love so much. Over two hundred and fifty years ago, they completely transformed a large, square piece of flat and boring land. By integrating a fabulous design that interweaves the gardens with the buildings, which are connected by covered wooden walkways, they created a sanctuary of beauty and harmony. The Ryokan has been open to guests for over two hundred years, and foreign guests have been welcomed here for the last fifty years, well before the rest of the traditional Ryokans in Japan agreed to admit foreigners. They have hot baths on the main level, and an aged owner who still goes into the garden every morning, to attend to his sculpted trees and weed the beautiful garden. One of the attendants who brought to our room hot water for tea and sweets after our daily long walks around Karatsu, was a funny and robust lady with a face so white that she looked like a Kabuki theater actress. Her rolling laugh was very infectious. We walked a lot during our visit to Karatsu. We roamed the streets, the shops, the rivers and bridges and walked along the sandy shores of the sea. 400 years ago, during the Edo period, they planted a vast seaside pine forest to naturally block the heavy winds and protect the city from the many strong storms coming from the sea. This wind barrier forest is called Niji-no-Matsubara. It was enjoyable to walk in the shade of the pine forest for 13 kilometers round-trip. The trees have reseeded themselves and multiplied through the years. Nowadays this pine forest numbers over a million trees. The force of the winds have twisted many of the tree limbs and trunks into fantastical shapes. We brought with us two pieces of fruit and an iced tea for the walk, but since it was a long distance, we needed some refreshments. From the forest, we spotted on the road a truck that operated as a burger stand, and we went there hoping they might offer a veggie burger to eat. “Karatsu Burger” didn’t offer a veggie burger, but they did agree to make us burgers without meat, but instead with an egg topped with a slice of cheese and their famous BBQ sauce. We sat on a bench in the forest along with other people who had stopped on the road with their cars, and we all ate our nicely wrapped burgers. They were delicious, and it was all we needed to continue on with our walk. On another day, we visited the old Takatori residence. Koreyoshi Takatori (1850 – 1927), was a very successful coal baron. His residence has been designated a National Important Cultural Property of Japan. We walked through the beautiful house and gardens that are now a museum, which teaches visitors about the period when Karatsu flourished as a coal producing area. Visitors to the Takatori Residence can see his house with its exquisite design, complete with a restored Western-style room with a plaster ceiling, cedar doors with intricate carvings, and paintings of nature on sliding doors. There are glowing old wooden floors and ceiling beams decorated with animals, reliefs of plants and even a Noh stage, on which traditional Japanese theater was performed to a small and intimate audience. As we walked, we admired the grandeur of the timeless Japanese-style architecture, so filled with the talents of wood carvers, painters, craftspeople and dedicated gardeners who together created an admirable sanctuary for living. But the highlight of our visit to Karatsu, and the main reason that we chose to visit, was to see the 400 year old Festival (Kunchi Matsuri) floats. The festival takes place in the autumn at the Karatsu-jinja Shrine. It has been going on for over 400 years, although most of the floats actually in use today date from the early to mid 19th century. The Karatsu Kunchi Matsuri is one of the major festivals of Kyushu island, and a few of their most extraordinary floats are demonstrated at festivals all over the world. This festival features floats that are called Hikiyama. The Hikiyama portray brave Samurai masks, a mythical turtle, a magical red snapper, a dragon, gold, green and red lions and other mythical creatures. In the 1600’s those intricately designed floats cost a fortune to make, an equivalent of millions of dollars each in today’s money. The current versions, in perfect condition with brilliant lacquer colors, are breathtakingly beautiful. The Hikiyama are made from thin bamboo frames that are covered with hundreds of layers of rice paper, which are then lacquered and finished with gold and silver leaf. They are all tall and quite heavy, and are housed in a purpose-built museum hall in which they are shown to visitors until they are paraded through town once per year, during the four day autumn festival. The largest one is 6.8 meters tall and weighs well over 3 tons. Unlike other Matsuri floats, they are not actually carried by the dozens of men who parade them, but are wheeled on wooden wheeled carriages, and the sight of hundreds of people powerfully hauling 14 floats through the sand along Nishinohama Beach, with their wheels often getting stuck in the sand, is an amazing spectacle. The images of lions, samurai helmets, sea bream, and flying dragons (called Hiryo,) are truly art pieces. The old floats were repaired many times through the years, with some of the eyes made of imported glass being replaced by local glass blowers, but they still retain their original forms to this day. The floats are normally displayed at the Hikiyama Float Exhibition Hall adjacent to Karatsu-jinja Shrine. The hall also displays clips from a recent festival showing the crowds and the difficulty of maneuvering the big floats through the narrow streets. The people parading the floats are traditionally dressed in different costumes and they shout, play musical instruments like flutes and drums and scatter salt for purification in all directions. There is an interesting story about scattering salt for purification. 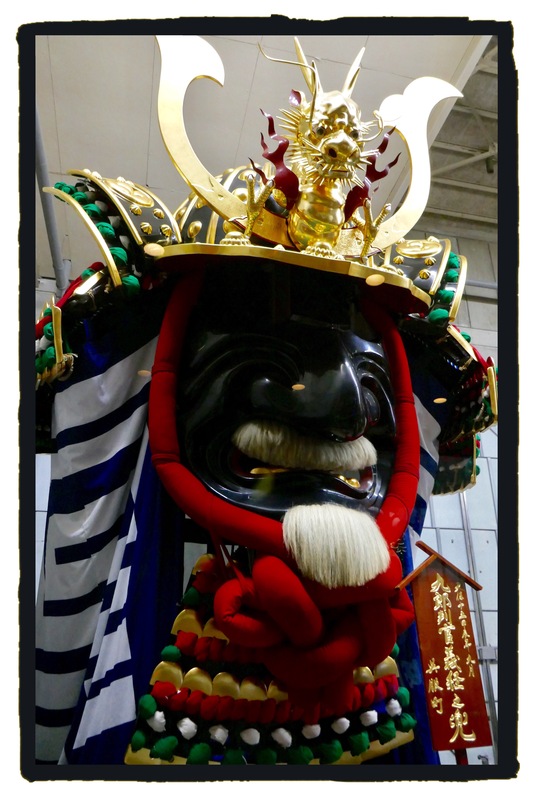 One of the floats that features a samurai black mask, belonged to the feudal lord Takeda, who in the year 1600 ruled over a mountainous area which had a limited amount of salt. His region once experienced a total lack of salt. Takeda received a large supply of relief salt for his people from his lifelong enemy, Kenshin Uesugi, another feudal Samurai lord who ruled over a territory by the sea. This act of honor touched me. Out of honor and respect to its history, Takeda’s Samurai float STILL does not scatter salt during the festival, even after 400 years and not even for symbolic purification. We ate only breakfast in our Ryokan, and did not indulge in their evening Kaiseki meals. We did enjoy every morning the locally made fresh tofu which we drizzled with a good quality soy sauce and ate with a spoon. For dinners, we chose local places to eat noodles, sushi and grilled Okonomiyaki which we cooked table-side on a griddle. From Karatsu, we return to Fukuoka to stay in an apartment we rented on Airbnb, and to start learning Japanese at the Wahaha language school.